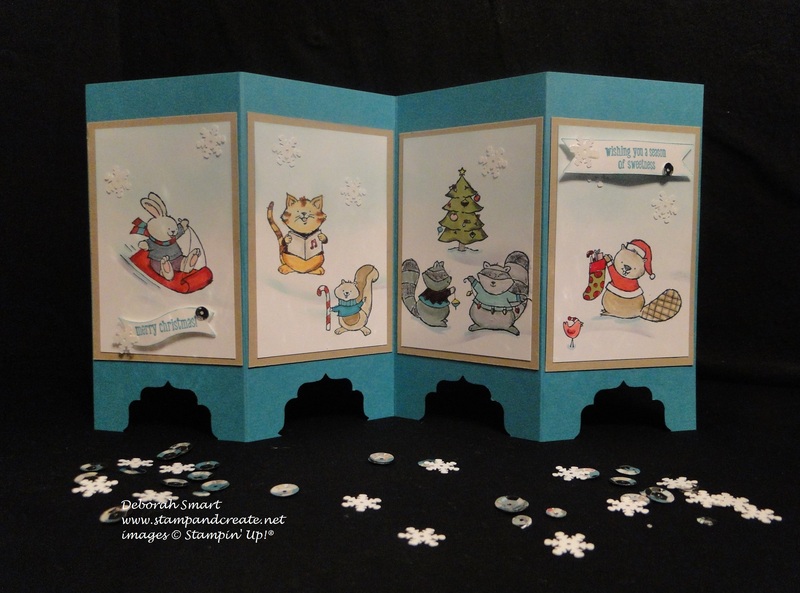 Welcome to our December edition of the Wacky Watercooler Blog Hop! This month we are featuring ‘The Best of…’ the Best of Current Stampin’ Up! stamps & products, the Best of Retired Stampin’ Up! stamps & products, and the Best of one project of one of our Wacky Watercooler gang! For the Best of current and retired, each of us have chosen our own stamps & products to showcase. For the Best of one of our gang, each of us was randomly assigned the name of another demo who takes part in the Watercooler Blog Hops; we then chose 1 project out of all the projects that person had done in the past year, and ‘cased’ it. CASE meaning – Copy and Share Everything! Since we often draw inspiration from each other’s projects and designs, it seemed the perfect thing to do! Before I share my projects – a little housekeeping information: if this is your first time enjoying a Blog Hop, prepare to enjoy! It’s very easy to navigate; each participating blog is linked to the one before and after, so as long as you click on the ‘Next’ (or ‘Back’) button, you will be taken through all the participating blogs, and you won’t miss a moment of creative inspiration! Alternatively, you can go to the bottom of this post, and you’ll find the list of blogs – you can simply click on the names, and you’ll be taken to that blog. 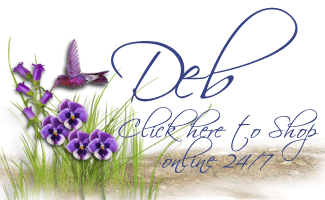 If you arrived at my blog by clicking on the ‘Next’ button, then you’ve just seen the amazing creations of Jeanne Kupsh – one of our ‘International’ demos, who is currently living in Germany. Jeanne never ceases to amaze me with her creativity, and I love her sense of humour! 🙂 If you’ve been travelling backwards via the ‘Back’ button, then you’ll be putting your socks back on, after having them knocked off by Priscilla Ivler, and her terrific projects! Right now I’m keeping my fingers crossed for Priscilla, hoping that the storm heading her way isn’t too severe! Now – here is my choice for the Best of Current Stampin’ Up!stamp set – it was very hard to choose, but I decided to stay with a Christmas theme, so that narrowed down my choices – a bit!! What really helped me decide was the fact that I realized that I have used these stamp sets the most of any of the holiday sets I’ve purchased. So that clinched it! Yes, I did say stamp “sets” – I couldn’t use one without the other, they go together so well! I loved this card so much, I made many of them, and sent them out to my family as my Christmas card for 2014! I made this side-step card with a base of Smoky Slate card stock (I also made a 2nd version, exactly the same but with a Soft Sky base). I then layered All is Calm DSP on each of the panel levels, then cut ‘snow drifts’ from Whisper White card stock. 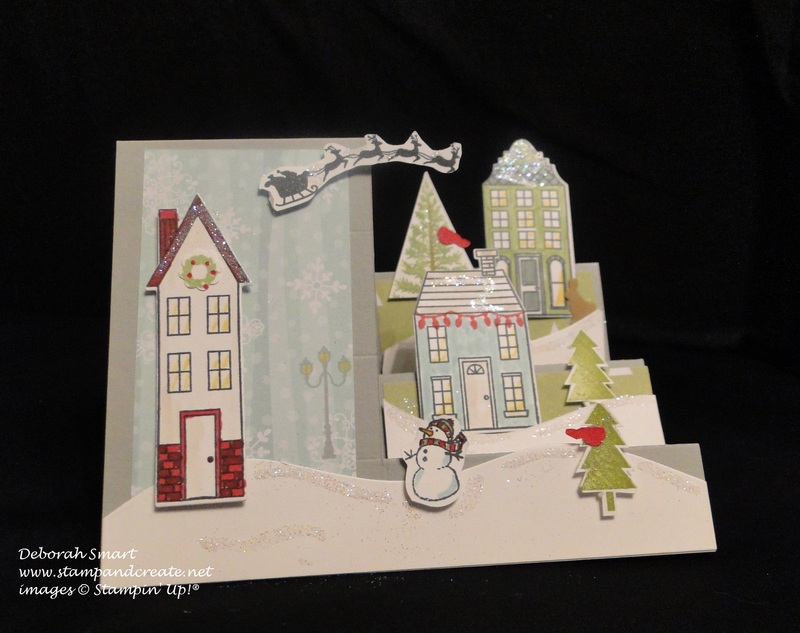 I then stamped and coloured the houses, trees and Santa & sleigh from the Holiday Home stamp set; the houses were then cut out using the matching Homemade Holiday Framelits Dies. The trees and Santa’s sleigh were cut out by hand. I stamped the snowman from the White Christmas stamp set. You may also notice that I added in a larger tree, from the Festival of Trees stamp set! (the only non-SU! product used are the little birds and the rabbit). Everything was coloured using the Blendabilites markers. I added a little sparkle to the scene by using my 2 Way Glue Pen, then sprinkling Dazzling Diamonds on top of the glue. For the assigned Best of – Wacky Watercooler buddy – I was very lucky to have drawn my friend Heidi Weaver! As Heidi has been participating in the blog hops as long as I have – which is since the very beginning – I had lots of fabulous projects to choose from – that was the hardest part!! Which project to CASE?? I finally decided to CASE a terrific little gift box for which Heidi created her own tutorial (of course I made it easy on myself!). You can see Heidi’s tutorial HERE – it’s super easy to follow! Isn’t that lovely? 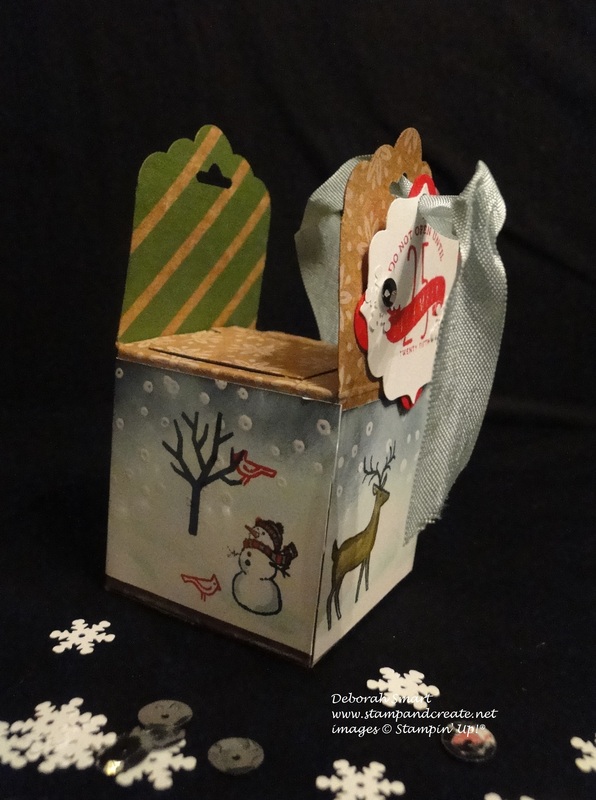 Well, of course this little box is perfect for gift-giving for any occasion – so I kept with the Christmas theme! 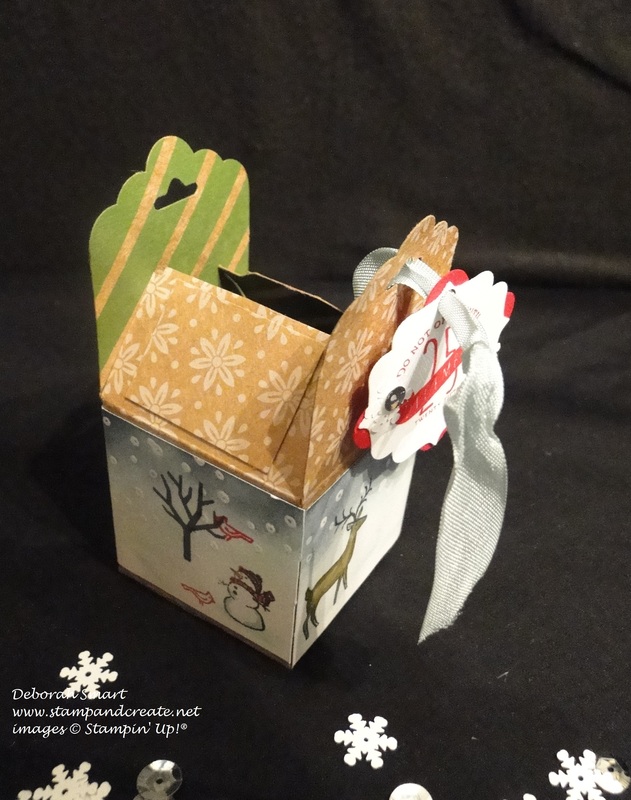 I assembled the box using the Under the Tree Specialty Designer Series Paper; it’s very sturdy, and if my gift is a bit heavy, the weight of this DSP can stand up to it, no problem! What’s that, you say? Oh yes – I’m using may favourite stamp set again! 🙂 This time, the focus is on White Christmas. 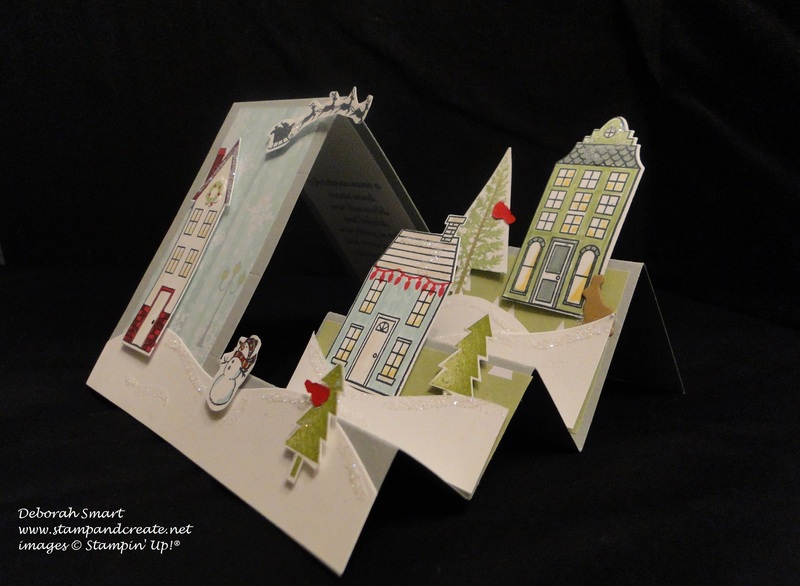 I wanted to create a winter scene, so I cut my Whisper White card stock to wrap all the way around the box, and did my stamping & colouring before attaching it to the box. First I stamped the snowfall in Versamark Ink, covered it with Clear Embossing Powder and heat set it. That way, when I sponged my sky using Sponge Daubers and layering Soft Sky, Pool Party and Night of Navy, the snowfall showed up white! (that technique is called Embossed Resist, in case you were wondering). I then shaded some snow drifts using Soft Sky and Pool Party inks and Sponge Daubers, using torn card stock as a mask. The tag is stamped from the Christmas Tagables Photopolymer stamp set in Real Red ink onto Whisper White card stock, and layered onto Real Red card stock. I used the Curly Label and Label Bracket punches to do this layering. This is a picture with the Scallop Top open – you can see the closed top! Do you remember this set? I think these critters are just adorable, and they are perfect for colouring in using our new Blendabilities Markers, and Stampin’ Write Markers. This set lets you set your imagination free, in colours to use and scenes to make. I think I’m drawn to these cute sets because it reminds me of Christmas as a child; I’ve always loved animals, and the best gift I ever got (I was 10 years old) was the book ‘The Wind in the Willows’ by Kenneth Grahame, first published in 1908, in which the main characters Mole, Ratty, Toad and Badger have many adventures! I created this screen card with a base of Bermuda Bay card stock; each panel has a layer of Crumb Cake card stock under the image panels in Whisper White. I again used Soft Sky and Pool Party inks to sponge the sky background, and Soft Sky, Wisteria Wonder and torn card stock to mask the snow drifts. Each critter was stamped using Memento Tuxedo Black ink, then coloured with Blendabilities and Stampin’ Write Markers. (I find that it’s okay to use the Stampin’ Write Markers with the Memento ink, as long as it’s thoroughly dried). After gluing the panels onto the screen base using Tombow Multipuprpose glue, I then added some snowflakes and sequins from the Frosted Sequins. The sentiments – both from the Merry Crittermas stamp set – were stamped in Bermuda Bay ink onto Whisper White card stock, the cut out using the Bitty Banners Framelits Dies, and the edges sponged with Bermuda Bay ink. They were then added to the card using Stampin’ Dimensionals. I hope that you’ve enjoyed my selections and creations, and perhaps inspired you to revisit the stamp sets in your stash that have been neglected for a while – you never know what you’ll find, once you start looking and playing! If you’re heading forward, please click on the ‘Next’ button below to visit Priscilla, and check out what she has in store for you – you won’t regret it! If you want to go back and re-visit Jeanne’s projects, then just click on the ‘Previous’ button. Before you go, I’d appreciate it if you leave a comment, to let me know what you thought of my projects and this edition of the Hop – I always love reading your comments! Deborah Smart – www.stampandcreate.net YOU ARE HERE! Previous Previous post: YEAR-END CLOSEOUT DEALS! Next Next post: Playing Catch-Up! I always love your projects, Deb and this is no exception! Thank you for sharing your talent with us!!! I can’t decide which is my favorite, they are all on my CASE list. Aw, thanks, Kath! 🙂 I hope you have a Merry Christmas! 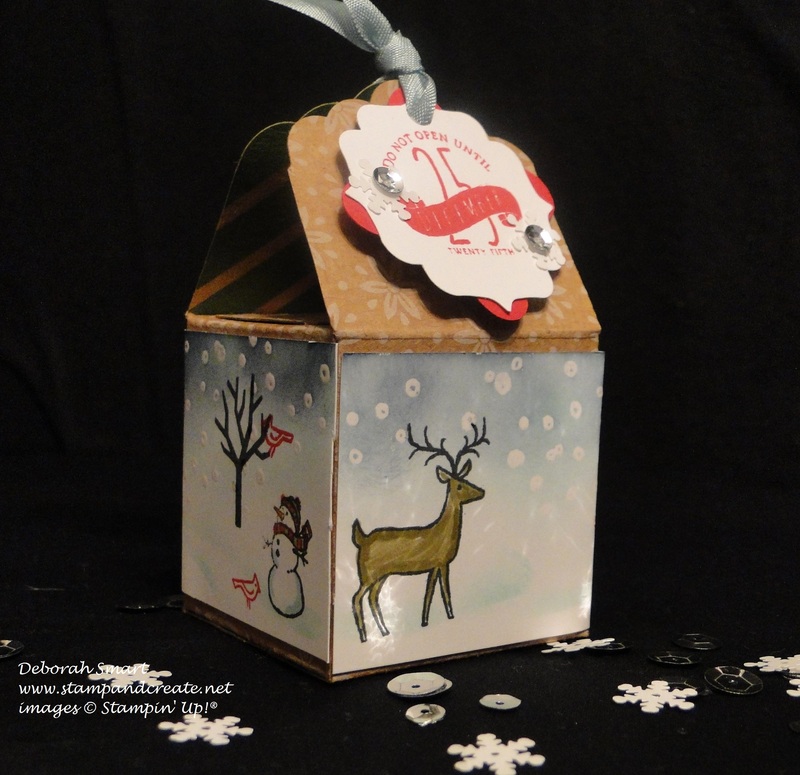 Gorgeous projects Deborah! I really like how you set your projects up to photograph on the black background and with those fun Frosted Sequins scattered around. Very clever! Thanks very much for your comments on my projects and set-up, Gail! I always struggle with how to take the pictures; I think I prefer the dark background over the white background, for myself. I hope you have a warm & wonderful Christmas, and a Happy New Year! I always look forward to your posts. You out did yourself again! Love your CASE! Now to do some casing of my own! Thank you for your kind comment on my projects, Marie! I’d be thrilled if you were to ‘case’ one of my projects. I hope you have a very Merry Christmas! You chose my favorite holiday sets, but put me to shame with your Holiday Home card! So much work! I’m sure your family will all love getting theirs! Great job with all your projects! Cute, cute, cute!!! You’ve outdone yourself! I love everything! I know those little gift boxes were a lot of work, but they look amazing – bravo! Have a very Merry Christmas! I love, love, love your creations. After seeing your take on Heidi’s tag box I so have to do this now. I am sure your family will love their cards, who wouldn’t. Using those stamp sets together is so cute. Merry Crittermas is one I missed and now wish I had it. For some reason it didn’t hit my priority list at the time. Love your screen card with it. Wonderful projects, Deborah! Loved the little critters! Miss Deb your entries have me feeling the warm and fuzzy Christmas feeling that seems to have inspired your designs. They are all fabulous! I’ll be pinning and CASEiing all the wonderful hop inspiration for many days ahead that’s for sure. So hard to pick a favorite so I think I’ll just say love them all for different reasons. The Merry Crittermas because who doesn’t like kid images and coloring…especially on such a wonderful screen background that shows off all the images together and at once. The box because…you’re right…Heidi’s design is brilliant and easy to follow and what you’ve done with it showcases just why I love White Christmas. Love the emboss resist technique too. The Holiday Home step card just took my breath away. The level of detail is amazing. Your family members are going to love it and likely will keep it for a Christmas decoration for years to come. I know I would. What’s a little glitter between family and friends right? Hee, hee. Hugs and love hop sister and thanks for the continuing inspiration and friendship. – J. Great work as always! Love the Christmassy box, so sweet! Thank you, Stefanie! I appreciate our comments. I hope that you have a Very Merry Christmas!